Shopping for a new Ford Escape? For the price of a 2018 Escape Titanium, you could get close to a Lincoln MKC. They’re mechanical cousins, but the MKC has a plusher cabin and a more powerful 2.3-liter turbo-4. The 2018 Ford Escape handles like a hatchback, looks like a crossover, built by a company that prides itself on SUVs. It's competent, whatever you want to call it, and that's what matters. Ford sells the Escape in S, SE, SEL, and Titanium trim. All offer all-wheel drive, and Ford fits a range of powertrains that range from frugal to frothy. The Escape still looks firm, taut, even nubile if you line it up against something as dowdy as a Subaru Crosstrek. It doesn’t toe the blocky-SUV line at all–a big turnaround from the first-generation Escape and its mini-Explorer shape. Today’s model is handsome and pert, six years into its lifespan, and a new front end applied last year only made it better-looking. The cockpit? We’re less convinced by it. Lots of undulating surfaces and complex cutlines turn it into a busy place and nibble into valuable passenger space. Send it back to edit and we’ll take another look. We’ll pass on ;he 168-horsepower inline-4 in the base Escape, thanks. It’s neither efficient nor quick. The smaller-displacement turbo-4 with 179 hp makes more noise but kicks in more low-end grunt and better EPA numbers. Make no mistake, if we bought an Escape, it’d have the 245-hp turbo-4 that creams rivals in acceleration and passing power: it’s a brilliant companion for the Escape’s sharp steering and very firm ride. The Escape’s in the CX-5 league of commanding road feel; it’s easy to needle through a favorite list of winding roads with paddle controls shifting its 6-speed automatic, all-wheel drive doling out power front to back as its wheels slip through tight corners. Your passengers may feel differently about the Escape’s very tightly controlled ride and the thumps induced by the biggest 19-inch wheels. 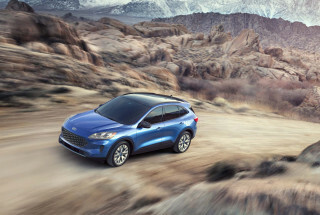 All riders will sense Ford’s devotion to spec-sheet details: The Escape’s seats are firm and thin, as if Ford had carved out every half-inch it could find to boost head and leg room numbers. The seats support us very well, but the initial impression is institutional. Cargo space is fine, and so is small-item storage–and the Escape’s gesture-controlled tailgate is a nice new-car party trick, same as its automatic park assist. The Escape lets down safety shoppers with relatively poor crash-test results. It overcompensates with features: leather, navigation, a tow package, and forward-collision warnings with automatic emergency braking. It’s made big gains in infotainment by dumping the old MyFord Touch interface for a new one with clear readouts, quick responses and lovely touchscreens. We should all be so bright and sensitive. There’s not much SUV in the Ford Escape’s snappy hatchback profile. “Inspired by hatchbacks.” If Ford signed off on a new ad tagline for the Escape, we’d suggest that. There’s nothing here that even vaguely recalls the Escape’s trucky-looking past. If anything, the Escape looks like the Ford Focus that lingers around showrooms, wishing it had more ride height and all-wheel drive. We still like the Escape’s pert sheet metal, six model years into its life span. 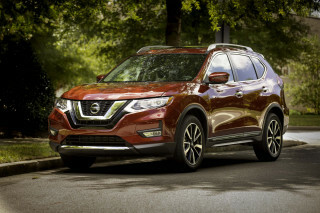 It’s an urban running shoe, trading off some ground-hugging lines for a tall roofline, a strike thrown right down the middle between rugged SUV and darty liftback. Last year Ford grafted a cleaner, crisper front end on it, and made it even better. The cockpit still throws us for a loop. It’s even more bold in its contours and its avoidance of SUV styling cliches. The dash crests and curves, and surrounds front passengers in an intimate space, but the rakish design forces some compromises. The Escape can feel confining, and the dash still bears the unmistakable timestamps of a CD slot and lots of little black buttons. There’s an air vent under the touchscreen that seems to exist to cool the car’s climate-control inputs. We’re more likely to see a completely new Escape than a rehashed dash; in either case, we’d point designers to the “delete” button and the decaf. Ford nailed the Escape’s scrabbly turbo-4 and its quick steering. Swoopy lines say everything you need to know about the Ford Escape’s performance. 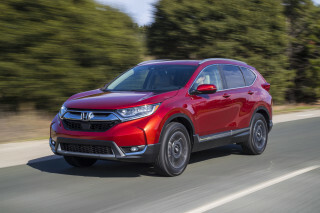 It acts more like a zippy hatchback than crossover SUV, especially when it’s fitted with the more powerful turbocharged engine. Three engines show up on the Escape spec sheet. Feel free to skip over the first one unless price is paramount. The base 2.5-liter inline-4 makes just 168 horsepower and 170 pound-feet of torque. It’s competent and reasonably smooth, but it’s rated the worst by the EPA and it’s the slowest of lineup. Last year, Ford introduced a new 1.5-liter turbo-4 with 179 hp and 177 lb-ft of torque. Acceleration isn’t much better than in the base 4-cylinder, but the 1.5-liter has stronger pull at low revs, and doesn’t downshift as much on the interstate. Its EPA ratings are higher than the base engine, but it’s nearly as boomy and noisy. The world would be a fine place if all Escapes came with the energetic 245-hp 2.0-liter turbo-4 that’s available on many models and standard on the Escape Titanium. It’s capable of scooting the SUV to 60 mph in about seven seconds, and has gobs of low-end punch and passing power. All Escapes shift gears through a 6-speed automatic that works fine, though it’s behind the 9-speed times. Turbo-4s have shift paddles, while the base engine has a sport mode and a shift switch on the gear lever that might be the least used part on any Escape that has it. 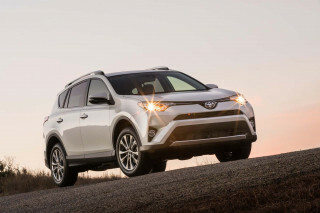 Most Escapes come with front-wheel drive, but all-wheel drive is available. Ford offers a simple system that splits power between the front and rear wheels, and can move power between them as wheelslip is sensed. The Escape can clamp its front brakes individually to simulate torque-vectoring, and to help the crossover corner more effectively. It doesn’t need much help. The Escape has polished handling and a firm, tossable feel that shines among the glumpy road manners of its competitive set. It controls its body with sport-sedan authority, and doles out steering that’s fast to respond, and weighty in feel, though it doesn’t have much feedback. The Escape feels more like an involving hatchback that just happens to have a little more ground clearance and cargo space; it’s on the end of the spectrum anchored by the Mazda CX-5. The downside is the Escape can feel too tightly wound in city driving. Ford slaps 19-inch wheels and tires on the Titanium models, and those heavy donuts can crash over potholes and speed bumps. Escapes with smaller circles on the corners yield an impressively smooth ride. The Ford Escape has thin, firm seats that aren’t to everyone’s taste. Ford appoints the Escape’s ample interior space with good materials, but its front seats might not suit all tastes. At 178.1 inches long, on a 105.9-inch wheelbase, the Escape is just a bit smaller than a Honda CR-V, though its wheelbase is 3 inches longer. The Escape cabin feels nearly as spacious as that in the CR-V, but the Ford comes in marginally smaller than the Honda by the yardstick, with 43.1 inches of front leg room compared to the CR-V's 41.3 inches, and 37.3 inches of rear-seat leg room compared with the Honda's 38.3 inches. The differences between the two illustrate perfectly how expressive styling can rob interior room. The Escape has a deep, heavily sculpted dash compared to the Honda; in the Ford the dash cuts into front knee room, and its footwells taper. There’s plenty of head room, but the Escape’s available panoramic sunroof has a deep mount, which slices into head room. The Escape has seats with slim profiles, too, as if engineers sought to carve out every spare cubic inch of room. They can seem too firm, though we’ve spent long road trips in them without complaint. The upside to their firmness is they feel more supportive than the seats in just about all comparable SUVs. Cargo space is mid-pack for the Escape’s class. It has 34 cubic feet behind the rear seat, which rises to 68 cubic feet when the rear seatbacks are folded down. 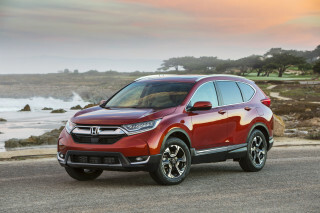 Honda’s trick one-flip lever is better and makes better use of space, but the Escape has a gesture-controlled tailgate that opens at the swipe of a foot. The Escape’s cargo floor also has a two-position load floor and the surrounding space is regular and trimmed out well. 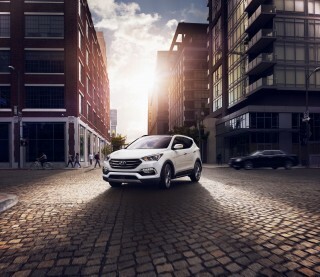 The Escape lags its rivals in standard advanced safety features. Ford has improved the Escape’s crash safety but it still lags some of the competition. The NHTSA gives the Escape five stars overall. The score is based on five-star scores for frontal impacts and a four-star score for rollover resistance. The IIHS says it’s good in some front and side crashes, but only "Acceptable" in small-overlap frontal crashes—no Top Safety Pick award. Ford now fits some Escape SUVs with forward-collision warnings and automatic emergency braking. Options include front and rear parking sensors, automatic park assist, adaptive cruise control, blind-spot monitors, and active lane control. 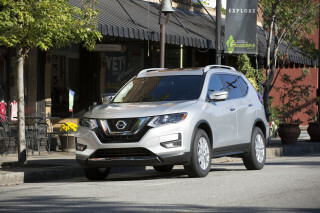 All Escapes have a driver knee airbag, a rearview camera, and a system that allows owners to limit the Escape’s vehicle speed, volume, and other functions. All-wheel drive can be fitted to all Escapes. A tow package adds better headlights and trailer-sway control, which uses stability control to compensate for the rocking motion induced by a trailer. The Ford Escape wins over crossover-SUV buyers with myriad features. The 2018 Escape can be configured in four trim levels: S, SE, SEL, and Titanium. Priced in the mid-$20,000s, the Escape S comes with the base inline-4, power features, a rearview camera, cloth seats, air conditioning, cruise control, 17-inch wheels, an AM/FM/CD player with six speakers, and Ford’s Sync infotainment control system with a 4.2-inch center screen. The Escape SE gains a standard 1.5-liter turbo-4 with shift paddles, satellite radio, a power driver seat, dual-zone automatic climate control, keypad entry, and heated front seats. A new Escape SEL slots in above the SE with leather seats, a power tailgate, an 8.0-inch touchscreen with infotainment, and rear parking sensors. It’s the best value in the lineup, by our measure. For all the standard goodies, you’ll need to spend into the Escape Titanium. It has a power passenger seat, a 12-speaker 390-watt Sony audio system, HD radio, keyless ignition, blind-spot monitors, rear parking sensors, ambient lighting, LED signature lighting, rear park assist, and 18-inch wheels. The Titanium’s infotainment system displays through an 8.0-inch touchscreen, and comes with navigation. All but the base model can be fitted with Ford’s 2.0-liter turbo-4. Other options can boost the Escape’s price tag to near $40,000. They include a panoramic roof, remote start, automatic park assist, and a towing package. Ford’s latest Sync 3 infotainment system shares some of the fine code that underpins Chrysler’s Uconnect. The interface looks clean and responds quickly to touch input. It pairs with a new Sync Connect app lets owners start, lock, unlock and locate their vehicles with their smartphones. Rivals are more fuel-efficient than the Ford Escape, but gas mileage isn’t bad. 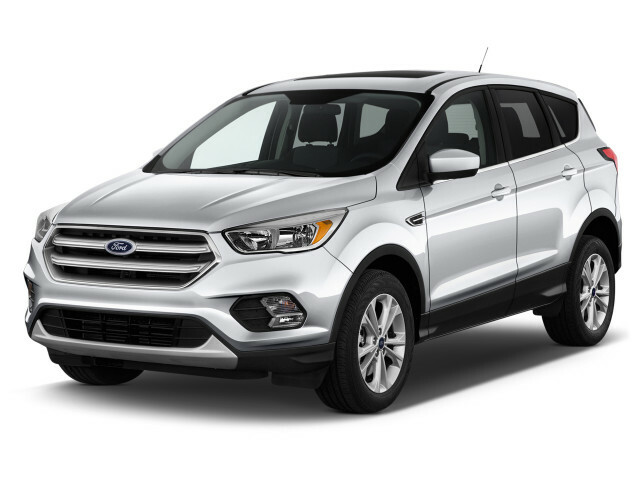 If you’re looking for the best crossover-SUV gas mileage, you won’t find it in the Ford Escape. Even within the Escape lineup, its base 2.5-liter inline-4 doesn’t turn in the highest EPA ratings. According to the most recent numbers, the inline-4 is pegged at 21 mpg city, 29 highway, 24 combined, when configured with front-wheel drive. 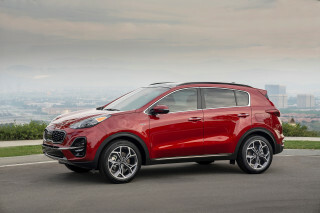 The 1.5-liter turbo-4 offered in the Escape fares better, at 23/30/26 mpg with front-wheel drive and 22/28/24 mpg with all-wheel drive. 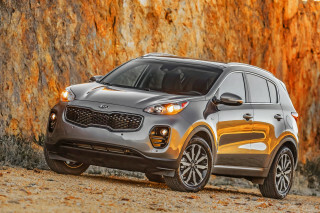 A 2.0-liter turbo-4 is the Escape’s most powerful engine, and its fuel economy is the lowest. Front-drive versions check in at 21/28/24 mpg and all-wheel-drive models are pegged at 20/27/23 mpg. All Escapes have active grille shutters to smooth airflow. The turbo engines have direct injection and turbo-4s have stop/start. Despite those additions, we haven’t matched the EPA numbers in our test drives. Looking for a different year of the Ford Escape?